Born Valledolmo, Sicily, June 7, 1872. Killed Chicago, IL, May 12, 1921. Upon his arrival in the U.S. in the 1890s, D'Andrea became an ordained priest. In 1899, he was appointed to serve the parish of St. Anthony in Chicago. Almost immediately, he left the priesthood to marry sixteen-year-old Lena Wagner. He took work as a translator but supplemented his income by participating in a coin-counterfeiting racket. He and his wife were arrested for counterfeiting in 1902. In an apparent effort to free his wife of the charge, D'Andrea pleaded guilty at arraignment. The U.S. Secret Service hoped that he would provide information against other members of the counterfeiting network apprehended in western New York, where some of D'Andrea's relatives resided, but D'Andrea said he could not identify them. On April 24, 1903, D'Andrea was sentenced to a prison term of 13 months and a fine of one dollar. He reached the Illinois State Prison at Joliet on April 25, becoming Inmate no. 8292. He was discharged upon the expiration of his sentence (with good time allowance) on March 4, 1904. D'Andrea subsequently received a presidential pardon from Theodore Roosevelt, allowing him to participate in politics. The 19th Ward on Chicago's West Side came to be dominated by D'Andrea, who also became an organizer of local Mafiosi and of union labor. Mike Merlo served as his understudy. Politics in that time and place was a violent business. Blood was spilled through bombings and assassinations. D'Andrea brought together the various Sicilian Mafia organizations of the Chicago area under his own brutal leadership. He was widely regarded as a merciless disciplinarian. 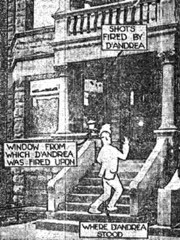 D'Andrea was shot and mortally wounded as he returned home in the early morning hours of May 11, 1921. The gunman fired at him with a shotgun from an apartment window looking out on the front stairs of D'Andrea's building. During hospital treatment, D'Andrea refused to reveal who shot him. He succumbed to his wounds on the afternoon of May 12. Following D'Andrea's death, Mike Merlo stepped up to the leadership of the Chicago-area Mafia. Informer (Apr 2009): The Dreaded D'Andrea by Richard Warner. Read about D'Andrea in DiCarlo: Buffalo's First Family of Crime.